Contact us here to have your book personalised! Welcome to this superb new selection of 100 killer sudoku puzzles, hand-picked for your solving pleasure! - The grid also contains sets of cells inside dashed lines (called 'cages'). Each of these cages contains a number. This is the sum total of the cells inside the cage. Therefore a 4' means that the cells in that cage sum to 4. A number cannot be repeated within a cage. A range of 8 different difficulty levels included. Think you're up for the challenge? Give it a go and let us know how you get on! 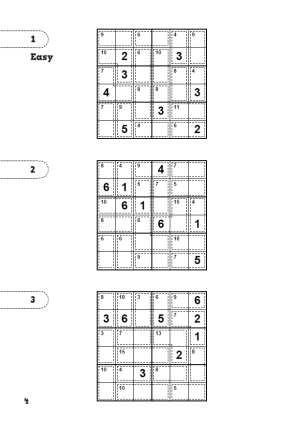 Can you crack all 8 levels and become a killer sudoku solving master? Good luck and happy solving! 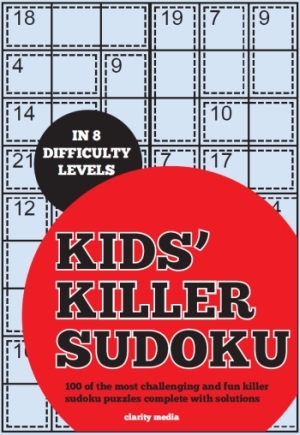 How hard are the killer sudokus? The book contains puzzles at a range of difficulties - starting with easy and moving through to hard puzzles towards the back. They are all solvable using logical strategies and you will never need to guess. The strategies needed will be familiar to anyone who has solved killer sudoku puzzles before for instance in a newspaper - every puzzle has a single unique solution that can be reached without incredibly difficult rules. If you are not familiar with the rule of 45, then it is worth reading about that before tackling some of the harder puzzles as it will help to solve them - there is more on that in the strategy tips on our regular-print Killer Sudoku Book page. Do you have other books for children available? Yes indeed we do - take a look in the left-hand menu or on the homepage and you'll see that several books are prefixed 'kids/childrens' particularly in the Brain Training section. Got a question not answered here? Then just contact us and we'd be pleased to assist!